Messy Paths is unique puzzle arcade game for iOS and Android. PC and Mac versions under development. The objective is to make balls of the same color collide and prevent balls of different colors from colliding into each other. These balls move inside a circuit which the player can dictate by tapping the switches located at the crossroads. Messy Paths is really addictive. It starts out easy, but you'll soon find that it gets increasingly difficult. 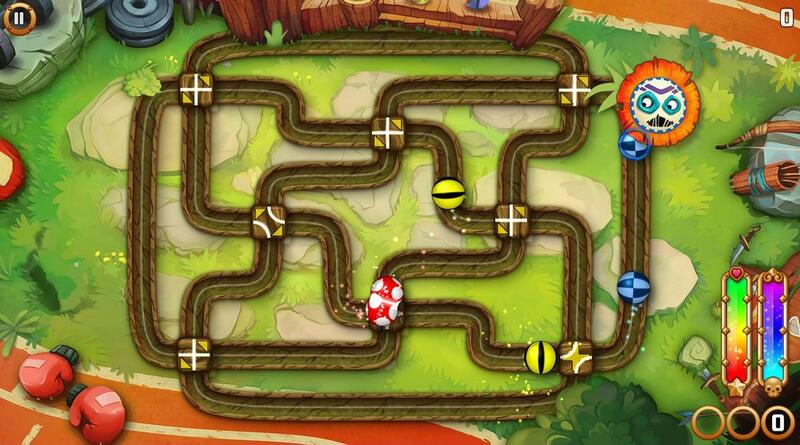 There are 215 levels to complete and the final few are exceptionally challenging. In a quest to defeat Doukan and obtain the Ring of Power, the player will encounter a total of 15 different level environments with 15 different bosses, each with its own distinct attack. Varying switches, special balls, charms, and other elements give the game a more complex touch. - Free. Contains in-app purchases and rewarded ads. Completely optional. - Over 200 levels. Game progression from easy to really challenging. - 15 game environments and 15 enemies each with its own distinct power. - Graphics and music by freelance artists. - Many types of switches and other mechanics such as the teleporter. - Balls with special powers. - Charms with different bonuses. Choose one per level. - Accompanied by a crazy story where you must save the world yet again. - Achievements and high scores for Apple Game Center and Google Play. - No Wi-Fi or internet connection required to play. - King-sized explosions and effects.